If we built it.... we can refurbish or replace it! Elwood has been manufacturing motors in Racine, Wisconsin sine the 1960's. During our long histroy, we have manufactured motors under serveral different brand names including: Gettys, Gould, Modicon, AEG and API. We have also added the Allen-Bradley/Rockwell F, H, N, W, and 1326AS legacy motor lines as well. Elwood is committed to long-term customer support and to preserving the significant installed base of motors that are effectively servig our customers on a daily basis. 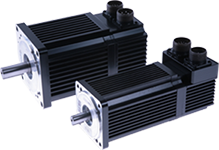 Elwoodactively supports the refurbishment and direct rplacement of all motors manufactured at our Racine facility. As the original manufacturer, we can return a motor to original specifications using original factory procedures and components. Elwood never uses "used" or "rebuilt" components when refurbishing or replacing a motor.